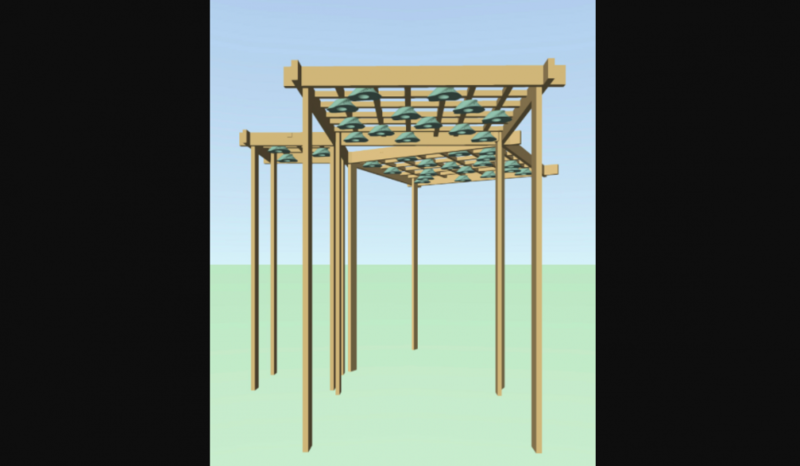 "Pythagoras' Garden" is a sounding arbor with a structure assembled in the shape of the original proof of the eponymous theorem, having a right-angled triangle in the center of three square structures. The structures are made from locally obtained, re-claimed wood. Thirty small speakers cast from adobe using plant-derived shapes as molds, hang from the arbor. Each speaker produces small sounds based on insect and bird rhythms, and other natural patterns. Each speaker is independent from the others, and all sound is generated in real-time and is constantly changing. The piece juxtaposes rational human thought and planning (as represented by the Pythagorean proof) with the rich and ever-changing world of rhythms produced by non-human biological ecosystems.